In a repeat of the 2013-14 quarter final, Barcelona were pitted against Diego Simeone’s stubborn Atletico side who were riding high in La Liga, 6 points off their opponents on Tuesday night in 2nd place, having just swept aside Real Betis 5-1 at the weekend. Barcelona, on the other hand, came into this fixture on the back of their first defeat in 39 games to none other than their arch rivals Real Madrid at the Camp Nou. Facing the other team in Madrid just a few days later, who on their day have proven just as difficult to beat as Real, ideally wasn’t what they were looking for in terms of a confidence booster. However, considering the absence of key Atleti’s centre-backs Jose Gimenez and Stefan Savic and Barca’s quite phenomenal record against los Rojiblancos (6 consecutive wins), Barca would likely have come into this game, as they do in every other game, believing they could come away with the victory. The game would prove tough for Barca as it so often does against Atleti, with Fernando Torres giving Atleti the lead in the 25th minute. The game was turned on its head in the 35th minute when Torres was given his marching orders after picking up a second yellow for a quite ridiculous foul on Sergio Busquets. This was exactly what Barcelona needed to find a way back into the game as up to that point, Atleti controlled the space excellently with a wonderfully organised pressing scheme in their 1st defensive phase and solid, compact shape deep in their own half. This didn’t last though, as eventually the 10 men of Atleti could no longer withstand the Barcelona barrage, with Luis Suarez’s double giving his side the advantage going into the second leg at the Vicente Calderon. Atletico’s game plan was clear from the start; however they were less passive in their pressure than expected. Typically in games against the top sides, many would expect them to retreat into a deep defensive block from the off and focus mainly on retaining organisation within their team shape. Although, as Simeone’s side have progressed, they have proven that they can go toe to toe with sides such as Barcelona, which was reflected in their approach until Fernando Torres’ sending off. Atletico set up in a staggered 4-4-2 shape with Torres and Griezmann leading the pressure and Yannick Carrasco breaking from the midfield shape to occasionally form a 4-3-3 shape with Torres and Griezmann. Ordinarily, deploying a defensive line as high as Atleti’s against the front three of Barcelona can be viewed as suicide, as Pep Guardiola discovered against Barca in the Champions League semis last season. However, Simeone’s men were well set up with a spatial control that stifled Barcelona’s ball circulation and build-up from defence. The image above depicts Atletico’s shape in Barcelona’s build-up phase. Torres and Griezmann are leading the press but choose to be passive when the centre-backs are in possession. The ball has just been passed to Mascherano, who ideally would like to play the ball into Busquets to allow Barcelona to construct play centrally. This is not possible, though as he is in the cover shadow of Fernando Torres. 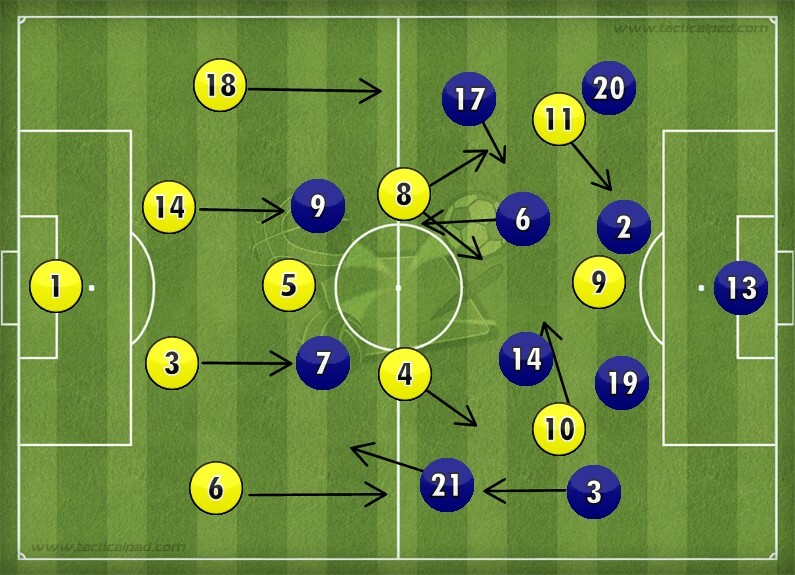 Instead of both strikers pressing the centre backs and potentially sacrificing the compactness of their side, they choose to sit off and overload the 6 space, as is quite common with top sides when playing against a team whose pivot is influential in constructing their attacks. Due to Busquets being unable to receive possession, Mascherano has no choice but to play it out wide to Jordi Alba, who appears to be in an ideal position to receive possession. He is likely to be put under pressure by Saul, who is free to break from the midfield chain to gain access and press the full-backs, as Carrasco did on the other side to a greater extent. Barca’s full-backs as a result were forced to make quick decisions on whom to release the ball to, which forced a fair number of transitions as they lost possession on a number of occasions. 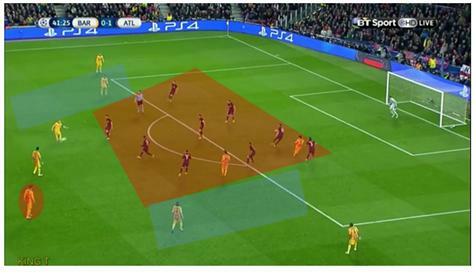 The shape deployed by Atletico was effective in that it caused instability in Barca’s construction of their attack. Their defenders being unable to bring the ball out and the rather frequent turnovers in possession meant that players could not set themselves up in the ideal position to play through the Atletico block. Simeone ensured that the team maintained their organisation but still allowed for flexibility when pressing, the shape was not so compact that it stopped Atleti players from gaining access to Barcelona men in possession and initiating pressure. This set the tone for Barcelona’s structure in the 3rd and 4th phases of possession, with their lack of central presence due to Atletico’s compactness greatly hindering the effectiveness of the front three and playmakers Iniesta and Rakitic. Barca could often be seen playing around the block instead of in between it. 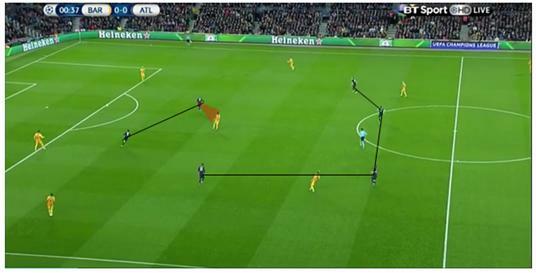 Atletico’s compactness resulted in an inability for Barca to play in between the lines. As a result, the ball could frequently be seen with the Barcelona full backs in the wide areas, the exact area in which Atletico wanted them to be. 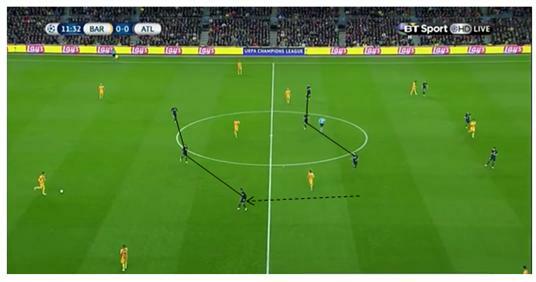 In this image, Atleti’s control of the space is very evidently hindering Barcelona’s presence centrally. It is when they were in their 2nd defensive phase that their pressure became more passive and retaining their position in relation to the overall team shape became essential. As we can see, Atletico have a substantial overload in the centre, with only Messi and Suarez providing any central occupation for Barca, who are struggling to penetrate Atletico’s defensive block. Credit must be given to Atletico for the way in which they controlled the half-spaces as well, areas in which players like Messi and Iniesta thrive. Messi had no option but to take up deeper positions on the field and roam centrally very frequently in an attempt to disrupt Atletico’s defensive organisation. In order to try and gain a greater central presence, Busquets began dropping in between Pique and Mascherano to create a 3 v 2 overload against the 2 Atletico strikers. Iniesta and Rakitic would both then drop deep to provide Busquets with two vertical passing options. However, Iniesta and Rakitic were both being tracked by Atletico midfielders. 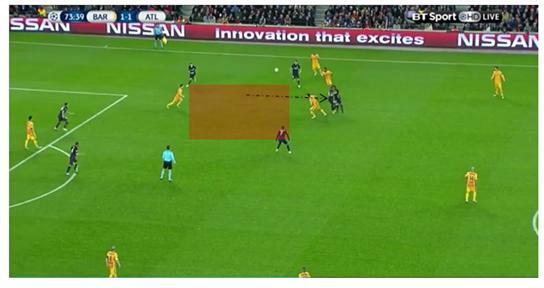 In the bottom of the image, Messi can be seen between the midfield and defensive lines of Atletico but is isolated. He was seen frequently throughout the game moving into central areas and rotating positions with Rakitic, which didn’t prove effective until the sending off. After Torres gave his side the lead on 25 minutes, Atletico appeared to be in total control of the game until Torres’ moment of madness in the 35th minute. The game changed completely after that with Atleti ceding control of the game and focusing entirely on seeing out the game for the last 55 minutes, an awfully long time to keep the European Champions at bay with 10 men on the field. It proved too difficult for them as they were no longer able to control the space with the desired effect. They became entirely concentrated in the centre, significantly condensing the active playing area, which although appeared to make sense had very negative ramifications. They fell into a state of pseudo-compactness, a concept explained in greater detail by Nachiketh Ramesh on OOTB. 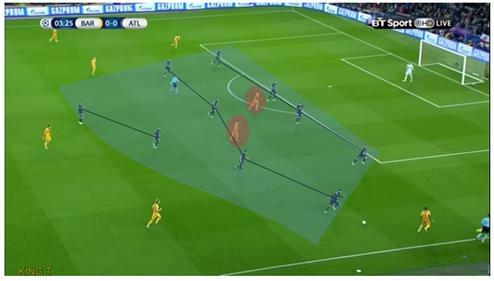 Torres’ sending off greatly affected Atletico’s horizontal compactness as is evident in the image above. His side now appear to be suffering from being too compact, the entire team is positioned centrally, however the other valuable areas of the field .i.e. the half-spaces, have been left exposed. As a result of this, Barcelona are now able to overload the half-spaces with ease, forcing the individual Atleti players to break out of their defensive shape, thus opening up holes within the defensive block for Messi and Suarez. They are faced with a problem as their insistence of maintaining organisation has led to a lack of access necessary in applying pressure on the ball. 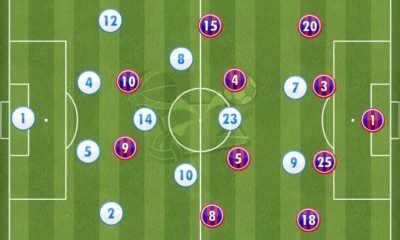 This means the Barcelona player now have a substantial amount of time to pick out a pass or combine with a team, as was the case with Suarez’ first goal in the 63rd minute; Messi played a ball out wide to Alves who was able to pick out a cross due to the aforementioned pseudo-compactness of Atletico Madrid. The ball finds Alba whose shot is deflected into the net by Suarez. Atleti’s shift in focus played right into Barcelona’s hands for a number of reasons, with arguably the most notable being that the Barca centre backs were now afforded much more freedom to push up deep into the Atletico final third. With one less man on the field, Atletico’s threat in the attacking phase was significantly reduced. Consequently, Barca could afford to send their centre backs in extremely advanced positions as there was little to no threat in defensive transitions. Mascherano is in possession, in a much more advanced position than he would take up normally. In this image he attempts to break the Atleti lines with a penetrative pass. Right behind him is Pique, who is also able to play this role due to the freedom he has been afforded also. This also has a positive knock-on effect for the Barcelona midfielders and Messi also as they no longer have to occupy deep positions as the centre backs are perfectly capable of circulating the ball and playing incisive passes. 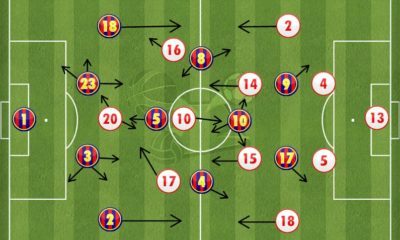 Their midfielders were now able to take up positions in between Atletico’s block, thus being able to create overloads in key areas such as the half-spaces as seen in the image above with Neymar and Iniesta in the left half-space and Messi and Busquets in the right half-space. Another beneficiary from the shift in momentum in the game was Lionel Messi, who after a quiet first half burst into life in the second as he was afforded much more time in possession in the final third. Passing options were now also much greater in number after the interval as Barca’s central presence grew as the game wore on. 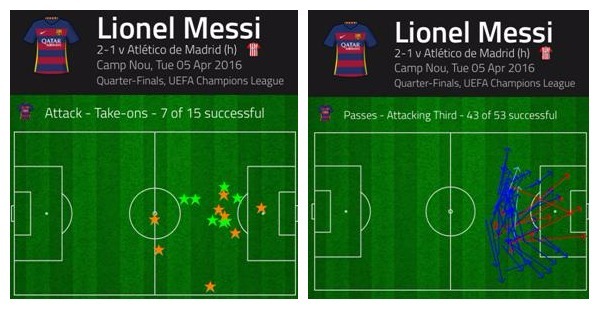 In addition to this, the freeing up of the half-spaces aided Messi greatly, throughout the game. In this image, Atletico bizarrely attempt to initiate an aggressive wave of pressure deep in their own half, which was bound to fail as a result of the extra man in Barcelona’s favour. Messi, in the right half-space find space in behind their wave of pressure and crosses the ball into Suarez who heads Barcelona into the lead. 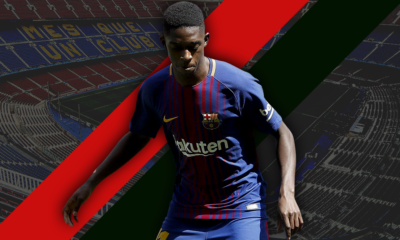 He proved to be a constant danger for Barca throughout the game with his influence growing more and more as the game wore on, particularly after the sending off. Despite the slight advantage in Barcelona’s favour, the tie still remains very open with a one-goal lead far from secure going into the second leg at the Vicente Calderon, where los Colchoneros have a record that is nothing short of formidable. Despite doing very well to overturn the deficit in the second half, Luis Enrique’s men can count themselves lucky considering the red card, as the result would likely have been very different had Torres remained on the field. 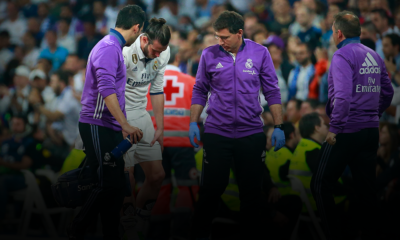 However a win no matter how, against Atletico Madrid no less, was essential following their defeat against Real Madrid. Simeone may feel somewhat hard done by after his side executed his tactical plan to perfection yet still came away with a defeat through no fault of his own. The omens for the second leg do not look great however, as despite playing very well against la Blaugrana wins against them are few and far between for Atletico.